Have you ever experienced a stabbing or dull ache in the buttocks, a spasm that shoots down from your hip or a burning pain in the back of your leg? 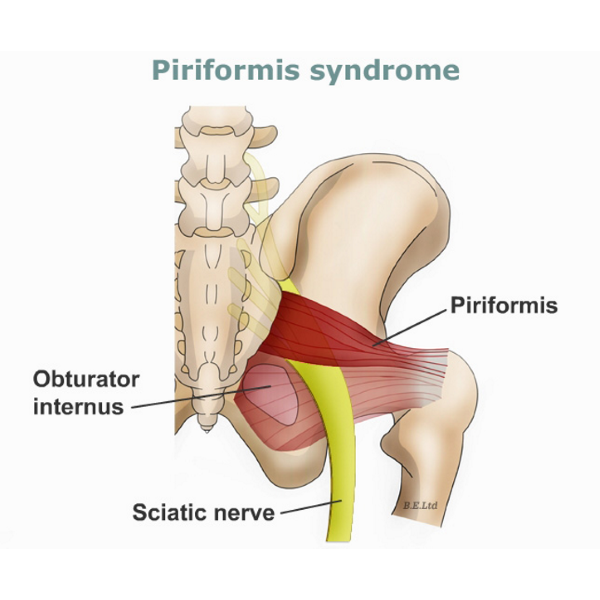 This uncommon condition is called the piriformis syndrom, and it’s considered to be an uncommon neuromuscular disorder caused when the piriformis muscle compesses the sciatic nerve. Besides being very unpleasant, an inflamed piriformis can seriously affect both your regular daily activities and your training efforts. The piriformis is a small and short muscle buried deep within the tissue of the hips and it’s a part of a larger group of deep muscles that are responsible for rotating the leg at the hip. It sits under your glutes, running from the back of your pelvis to your outer hip. Thanks to its prime position, the piriformis assists in both of the hip rotations: it helps rotate the leg outward when the hips is extended but also helps rotate the leg inward when the hips is flexed. However, the piriformis muscle is also positioned immediately adjacent to the sciatic nerve – a very thick nerve that provides the nerve signals which allow all of the muscles on the back side of the lower body to fire at the right moment, which is the reason why it runs from the buttock all the day down to the foot. And the small piriformis muscle has a bad reputation for causing terrible sciatic pain in many people. When the piriformis is irritated, the sciatic nerve can easily get irritated as well. When the piriformis gets too tight, it pinches the nerve and causes a painful sensation at certain points along the nerve’s path, eventually resulting with inflammation of the sciatic nerve. In addition, the piriformis muscle dysfunction may overlap with a variety of other problems, such as gluteus medius dysfunction, herniated or bulging disks, pelvic stress fractures, tight adductor muscle group, limb length difference, tight medial hamstrings and the aforementioned ineffective gluteus maximus. But one of the important factors that contributes to a tight piriformis is the lack of hip internal rotation, often caused by lack of core strength, decreased iliacus firing and decreased arch strength. It’s a good idea to start with core-strengthening exercises in the transverse plane, because a weak or imbalanced core is not very effective at stabilizing the top of your pelvis and spine and places too much workload on the hip muscles. A brief online research would tell you that piriformis inflammation can be healed by special stretches and exercises. However, this idea rarely works in reality and you would actually benefit a lot more from strengthening your gluteus maximus by doing hip thrusts, squats and deadlifts than stretching, since it’s quite possible that the other muscles in the area are weak so you’ve been putting too much stress on your piriformis muscle. Another important fix is to stop clenching. You want to allow the muscle to fully lengthen to get stronger, and clenching keeps it weak and tight. To prevent this from happening, perform very controlled squats with a box and focus on the eccentric portion of the movement. Keep proper form – especially proper pelvic alignment – all throughout the exercise and gradually lower the box to increase the challenge. After a few sets of squats, progress to the 90-90 exercise. When performing this exercise correctly you need to keep your core engaged and prevent flipping into an anterior tilt, while keeping the glute max, piriformis and tensor fasciae latae relaxed.